It has been a year since we ate at somewhere new and interesting, as for various reasons we took a 12 month hiatus from dining out. 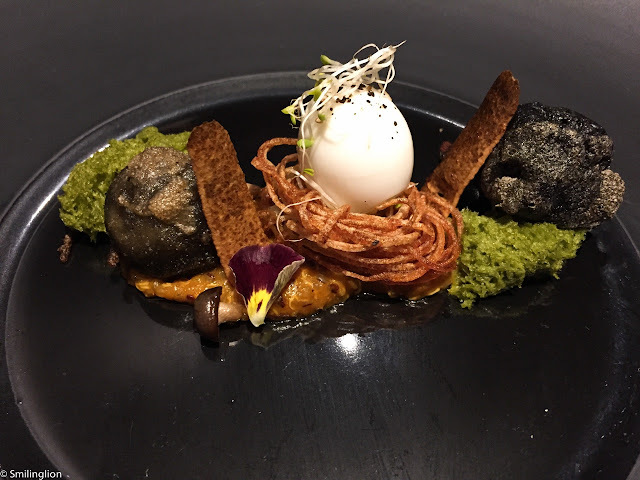 During this time, a few local eateries have sprouted up, each of which has very defined and daring concepts targeting the increasingly discerning yet still value-seeking Singaporean dining crowd. With the burgeoning reputations of the elite fine-dining restaurants in Singapore such as Andre, Jaan and their like, a second tier of up-and-coming chefs are taking the opportunity to impose their personalities in this market as well. One of such restaurants is Labyrinth. Of all the newcomers on the dining scene, this is the name about which we have been constantly hearing. Located right between the increasingly hip Duxton and the already established Keong Siak /Bukit Pasoh restaurant belt, it occupies a smallish shophouse ground floor unit next to a busy main road. Inside, a large bar dining area dominates and there are but a handful of tables for larger groups. The chef LG Han is self-taught and his restaurant is all about Singaporean (and other popular local) tastes presented in innovative form using avant garde molecular cooking techniques. In many ways (but without making any qualitative comparison between the two), Labyrinth seems to be positioning itself to be to Singapore what Alvin Leung's Bo Innovation is to Hong Kong. For the evening, we were presented with two fixed menu choices. 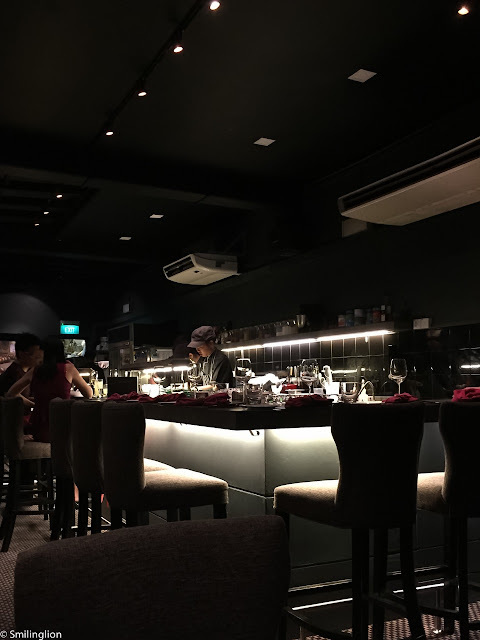 We opted for the slightly longer Heritage Menu which showcased the popular dishes rather than the Signature Menu which had the chef's most current creations, because this was our first time there and we wanted to try Chef Han's 'famous' dishes. Kaya + Butter, Rojak: This was a delightful re-creation of our local breakfast food. 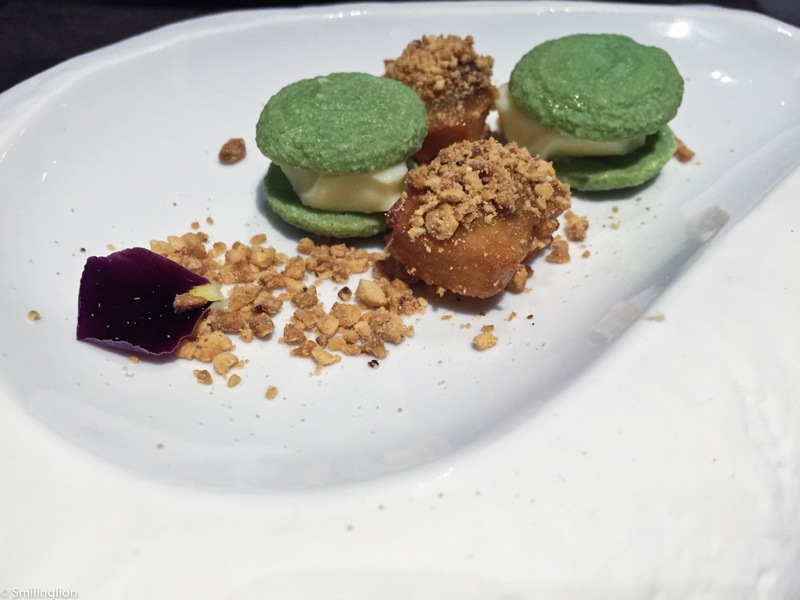 The "kaya" (which is the local coconut and pandan jam) was a crude macaron (it wasn't technically a macaron, but was a dollop of butter sandwiched by two pieces of kaya meringue). The "rojak" (which is a local salad dish of nuts, fruits, vegetables and topped with sweet sauce) was a small piece of dough fritter doused with palm sugar sauce and crushed nuts. 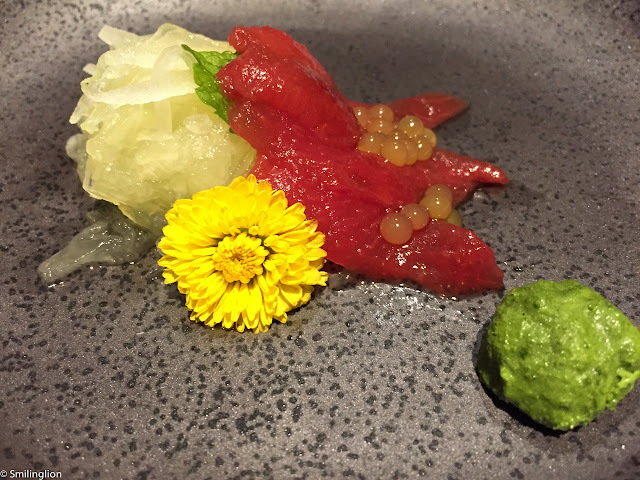 "Sashimi": This was a dish of sliced honey dew, watermelon, watermelon 'caviar' and a meringue of basil. It was beautifully presented but fell short of expectations. The sliced fruits were basically tasteless and the chrysanthemum flower could not be eaten (I tried, it was too bitter). The only saving grace was the basil meringue which we thought was quite clever. Laksa (coconut noodles and grilled oyster): Our disappointment brought about by the "Sashimi" dish was short-lived though. 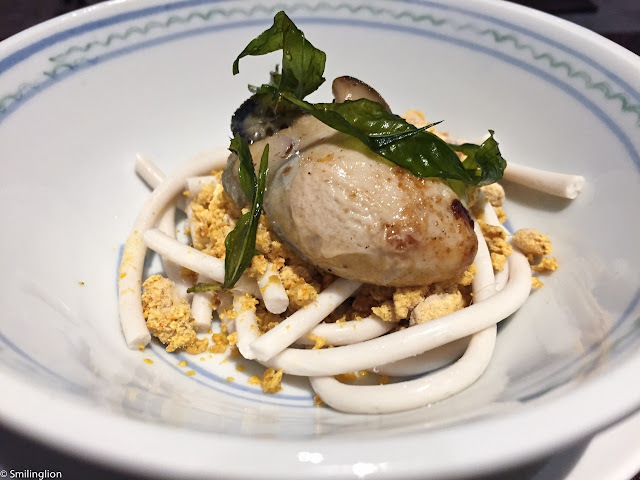 Chef Han's version of the iconic laksa dish was quite inspired. He replaced the rice noodles with noodle-shaped coconut jelly, and the coconut and curry soup was dehydrated into powder form. The succulent grilled oyster was the seafood representative (usually it is prawn) and crispy curry leaves topped it all. Eaten all together, the laksa flavours came out very well. Duo of Dim Sum (squid ink "Paella"): This was a recreation of some popular dim sum dishes using western ingredients. 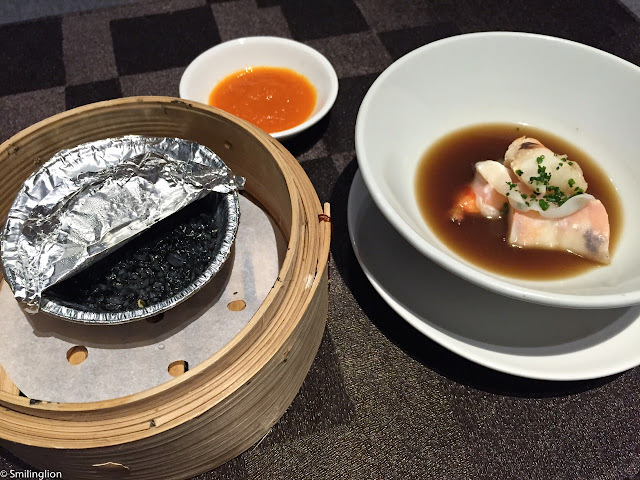 The 'har gao' was essentially large chunks of prawn wrapped by thinly sliced shrimp (replacing the wonton skin) in a thick prawn broth, and the 'glutinous rice' was a delicious squid ink paella. Accompanying them was the 'chilli' made with red peppers. Labyrinth Chilli Crab (chilli crab ice cream, tempura soft shell crab): This was Chef Han's signature dish. 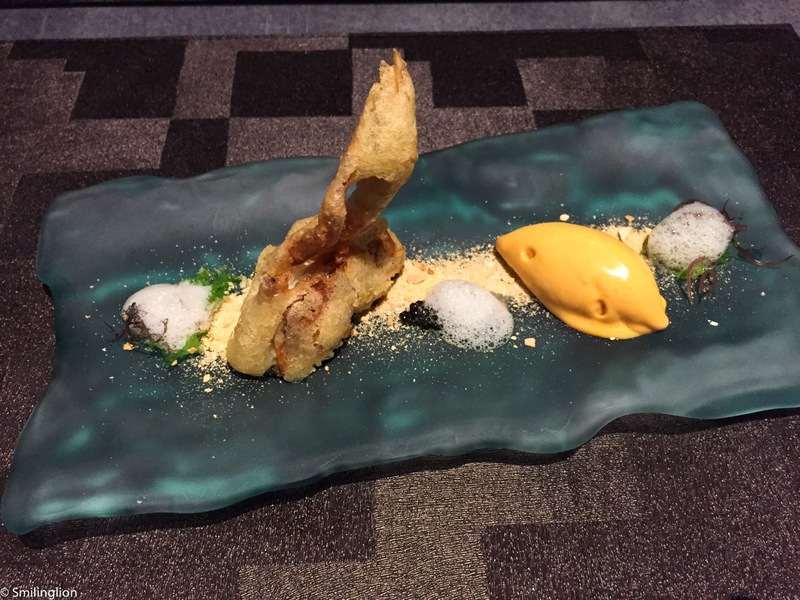 He recreated one of the most well-loved Singapore dishes using a deep-fried soft shell crab on a bed of 'sand', with prawn bisque being the 'foam from the crashing waves', all plated on a surface resembling water. And the chilli crab sauce was in ice cream form. All eaten together, this was quite brilliant. 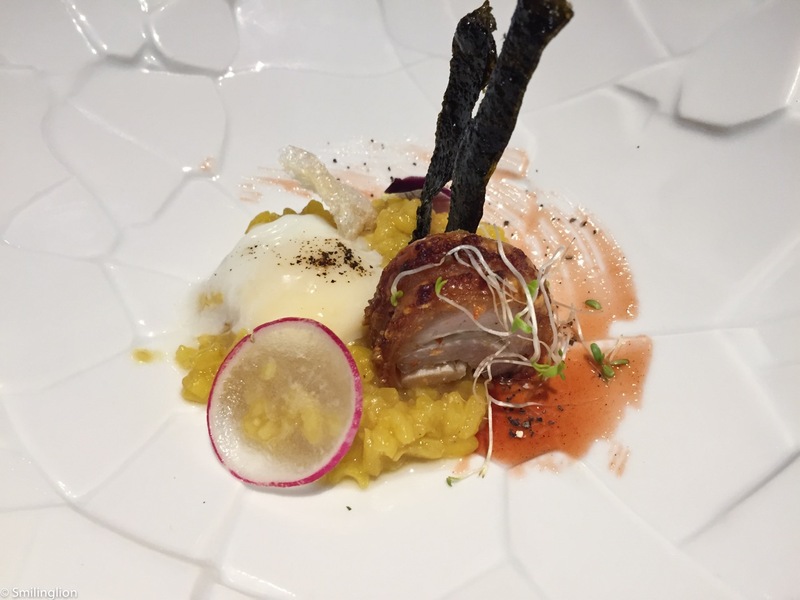 Siew Yoke Fan (roast pork roulade, "ramen" risotto): The reinterpretation of the classic roast pork rice was in this case a very nicely roasted pork belly on a bed of risotto made with ramen-style pork bone stock, with a runny egg yolk on top and some char siew honey marinate completing the dish. 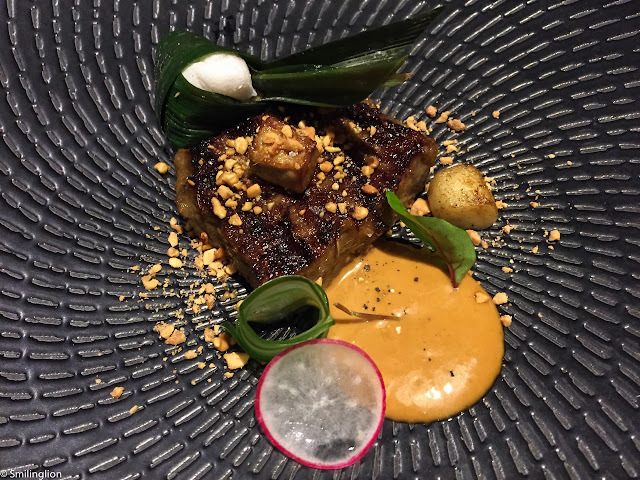 Satay Ribeye (satay wagyu, onion gnocchi, peanut mochi): The best dish of the evening was the grade 6 wagyu beef marinated with sweet sauce and grilled over charcoal fire. It was full of flavour, and paired with the peanut sauce, it felt like we were eating an upgraded version of the local favourite. The 'ketupat' in this case, was a peanut mochi wrapped in coconut leaves (replacing the traditional rice cake). Hainanese Curry Rice (curry quinoa, chicken mousseline, coriander sponge): This was a strange dish. We could discern the curry, the poached egg and the rosti, but could not really find the link with the traditional Hainanese curry rice. 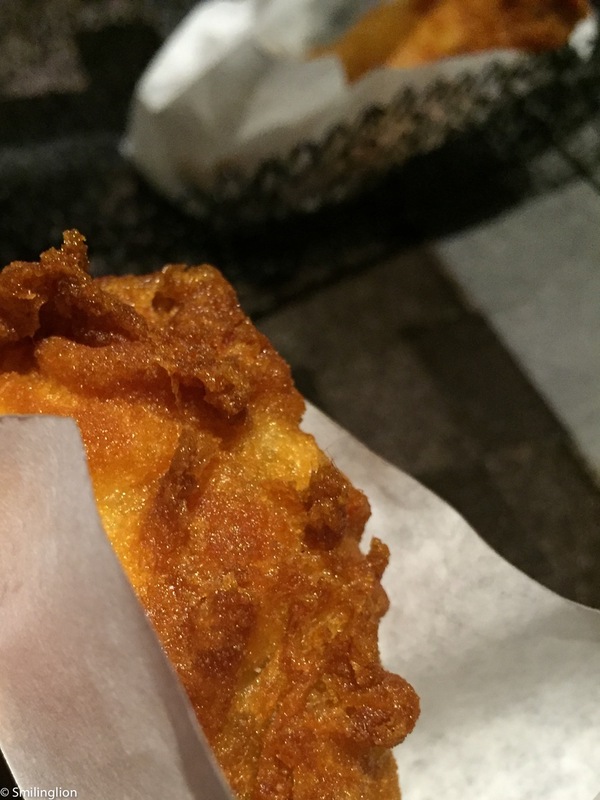 In fact it reminded us more of a traditional curry puff. On its own, this dish was not bad but we didn't understand what it was supposed to represent. 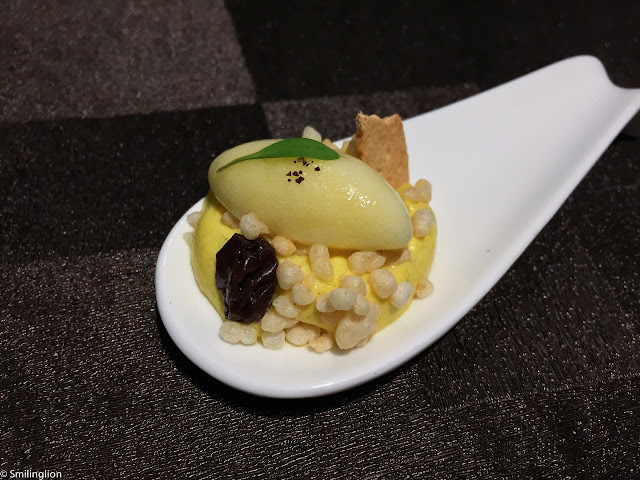 Pineapple rice crispy: This was a palate cleanser before dessert. Pineapple sorbet with rice crispy bits. It was quite refreshing. Chendol XLB (gula jawa icicle, coconut and red bean soup, har gow skin): This was a clever take on one of my favourite local desserts. Normally taking the form of shaved ice topped with green jelly and red beans and doused with coconut milk and palm sugar, this version deconstructed the key ingredients. 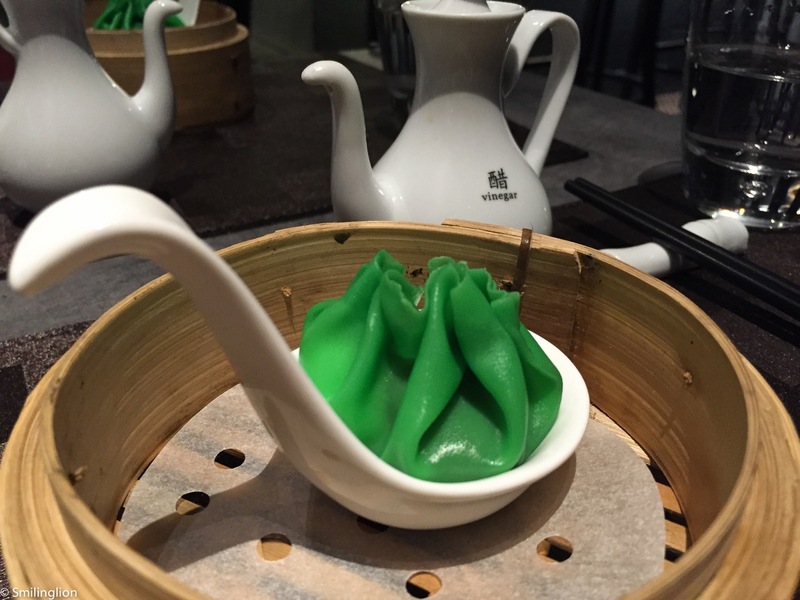 The green jelly became the 'xiaolongbao' skin, and the coconut and red bean soup formed the soup filling of the 'xiaolongbao'. The vinegar bottle on the side contained the palm sugar which had to be poured over the 'xiaolongbao'. Pisang Goreng (rajah banana cream): Another local favourite is the deep-fried banana. This version was a double-fried banana ice cream. Very clever and tasted very much like the original. 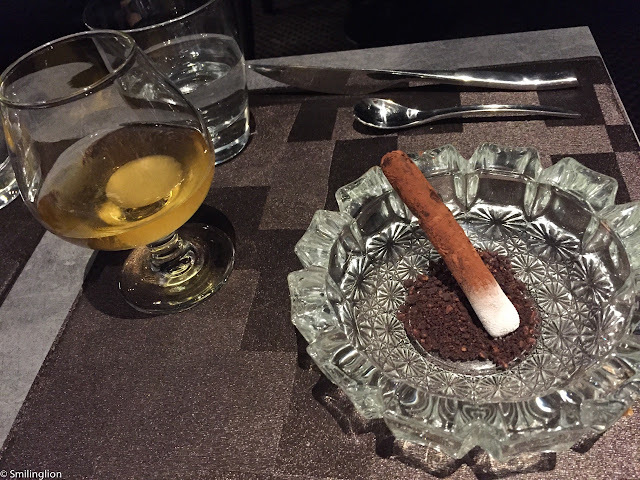 Reese's Chocolate (peanut butter ice cream, cocoa peanut "ash"): The 'cigar and cognac' was actually a stick of peanut butter ice cream coated with chocolate powder accompanied by an earl grey tea. The 'cigar' was very nice but the cold earl grey was quite insipid. It would have been much better if the cognac was indeed that. Local Breakfast (panna cotta, mango puree, sweet balsamic sauce): But the best dessert of the evening was this. It was presented in such a way as to bring about strong feelings of nostalgia. 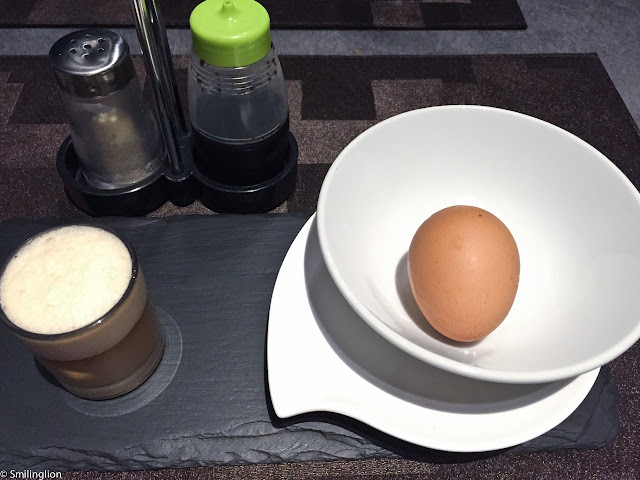 What we saw was a half-boiled egg with soya sauce and white pepper condiments accompanied by a frothy milk coffee. 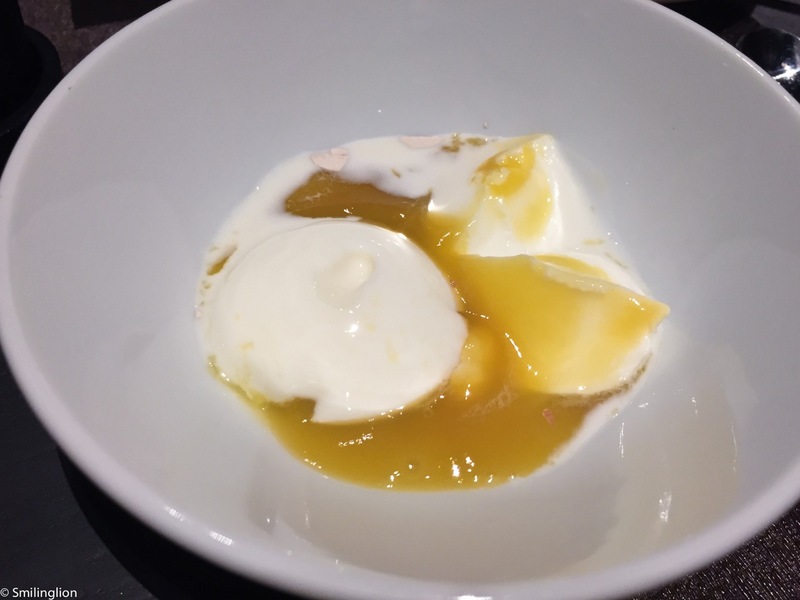 In reality, the egg was cracked open and out came panna cotta and mango puree (which looked like soft boiled egg yolk and egg white), the 'soya sauce' was sweet balsamic sauce and the 'white pepper' was almond powder. The 'milk coffee' was a cappuccino creme brûlée. Our meal at Labyrinth, though not perfect, was very satisfying. Aside from a couple of dishes we didn't like, for most part Chef Han got it right. We think he successfully used modern cooking techniques to recreate the popular flavours. The dining experience was less gimmicky as we had expected it to be, which is a common trap which many similar restaurants would fall for. Service was earnest without being self-important and the kitchen didn't try to impress us with too many fancy ingredients. This was all about the food and the end product showed that. However, clever as many of his dishes were, it only made us long even more to have for supper the actual traditional food which Chef Han's cuisine purports to represent.